This above is a part of what I wore today. 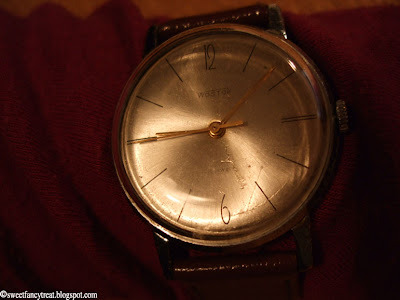 I needed a watch and as I don't have one of my own, I got my grandfather's old watch. I can't remember a moment in time where my grandfather didn't wear it. And you know what? I'm sure to keep it for now. It has a really high precison mechanism (can you even say that?). Aaaand it requires manual handling to work properly, because it doesn't have any batteries. I mean, you can't get more authentic than that, can you? Train your mind, keep your spirit fresh, unless you do that, the time stops. Haha. After fifty of doing it's still doing its job. It stays now on my wrist... Yes, I did my research on that. Hear me roar, Listen, Listen, Listen. Oh wow, that watch is absolutely amazing! !